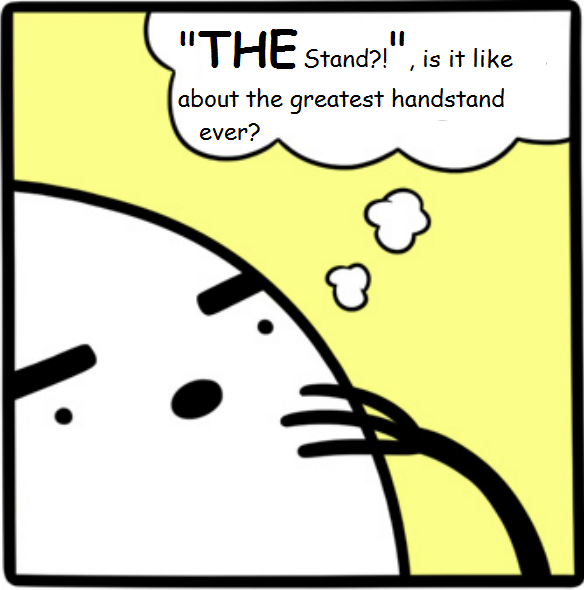 So I’ve been taking time out of the daily grind and reading this almost 1500 paged monster of a book called “The Stand” by Stephen King. It’s a pretty good read so far. The funny thing is, I caught a major case of the sniffles(the symptoms of Captain Trips) the first day into the book. There was that, “I’m trippin on Captain Trips baby” feeling, which was like experiencing the book in 4D – a real drippy-snotty experience. Oh wait, I’d be dead if I had Captain Trips, so …. Yay! Which reminded me that I was in a similar predicament when I read the “Tommyknockers” some 3 years back. As one of the main characters Jim Gardener had his blackouts and headaches, I was having my own, once in a blue moon migraine. I would like to believe it was my body that ever so sentimental prick, sympathizing with the characters in the book. Anyway, with that migraine around I could only manage to curl up under the blanket in the fetal position and wish it away. If I were the lead in that book, I wouldn’t be as dependable as good old hungover Jim fighting off those killer home appliances. I wonder how far he’s gotten on that alien ship….? Being able to relate to a character is a real great way to get into the characters head. The sneezing, the migraines are just unconventional, amusing and in the case of migraines, uncalled for ways to fuse myself with the book and look through the eyes of character/s. God, I hope there’s no character out there with explosive diarrhea waiting for me to relate to him. So anyone ever been in a similar situation where reality seems to be mimicking fiction? Oh and, whatcha reading right now reader?